The new modules that come with the Customizer software expand the usefulness of Roland's cable-friendly Eurorack boxes. Expands the capabilities of the standard units considerably. Limited number of custom module slots makes only relatively simple synths possible. Last year we took a look at the Aira Modular effects modules. It seemed that Roland was sticking quite determinedly to its 'keep it digital' line in terms of resurrecting the sound of some its old-school classics. The TR-8 took care of X0X drum duties and the System 1 (and 1m) addressed synth territory. Since then, Roland has released its fully analogue System-500 modules. This is clearly a bold move, but for the time being at least, appears to be the exception to the rule. 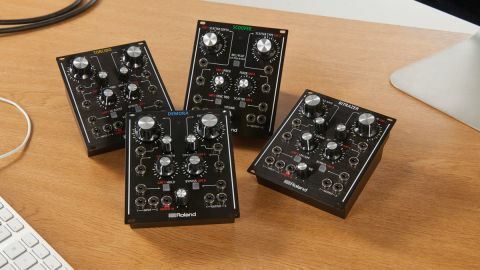 In the intervening time, Roland has updated its Aira Modular Eurorack effects modules with even greater capabilities as far as customisation is concerned. The street price is also lower than the RRP on release, making them more attractive still. Here we'll be exploring the latest (v1.5) Aira Customizer software, though it's worth recapping on what the hardware actually does in a box-fresh state before seeing how it can be repurposed via software. Each box comes as a self-contained processor laden with knobs and sockets. On the rear there's a socket for the included PSU and Micro-USB connectivity. If you have a free Eurorack space then the Aira Modulars come equipped with the relevant power adaptor, though they do all sit comfortably on the desktop. Torcido is a distortion box with basic tilt EQ and tube-warmth control. It is the only one of the four units that includes a front-panel reference to analogue emulation. Demora is a stereo/dual mono digital that offers a hefty ten seconds maximum delay time. Each delay line can be offset against the other and the freeze function is great for ambient washes and unusual rhythmic treatments. Scooper provides similar effects to those found on the TR-8 Scatter function, though with more control and audio looping features. Bitrazer is a bitcrusher and filter combo box. They are all broadly useful in themselves, though not perhaps groundbreaking or cheap. However, the Aira Modular Customizer software allows you to create processors of far greater complexity. In its original release state this included some very useful additional building blocks. Modulators came in the form of an LFO (that could reach into the audio frequency range), a 4-stage ADSR envelope, and a Sample & Hold generator. All could be triggered from an external Gate signal, or one generated by the MIDI Clock to Gate module - which could in turn be processed by a gate divider/multiplier unit. Triggers could be used to create tempo information routed to a variable CV out. A Noise module was the only real sound generator, though audio could be processed through two multimode filters (6 and 12dB/octave), a very basic EQ and Ring Modulator. Throw in a four-channel audio/CV mixer and twin VCA module, and you get the picture - useful, but nothing radical. Although programmable, there was never a way of turning Bitrazer into Demora, for example. This is still not possible, but the latest software ups the ante for sound generation, along with some other welcome additions. The two oscillator modules, although ostensibly labelled as Saw and Square waveform generators, have a Color control that alters their harmonic structure, and thus allows them to create a wider range of flavours than on first glance - this is also a modulation destination. Both have CV inputs for fine pitch control and waveform sync trigger ins and outs. All this would be of no more melodic use than a dub siren without some way of playing them. Luckily the new MIDI Note to CV/Gate module comes in, allowing you to route USB MIDI messages into virtual analogue format. Combined with the earlier Amp and ADSR modules and new filters (18dB/ octave, 24dB/octave and Formant types) this makes for a compelling mix. Now you can turn your small effects box into a fully-fledged synth. However, the limitation of available module slots in the Customizer software means that compromises will always be required. For example, if you have two oscillators and filter, there's only space for one envelope. Drop one oscillator and you can add an LFO etc. Of course, if you have two modules, then building a more elaborate set-up is possible, but it will lack the immediacy of a true analogue modular or digital recreation, with a neatly labelled front panel. If you are a modular aficionado then this may be a way of adding interesting extra functionality in a small footprint, but we can't see it appealing to purists. Those more used to a software-only environment may be equally dismissive, given that these are digital at heart and face competition from some excellent software synths and processors with a lot more scope and power. Overall, we suspect that, for the most part, the Customizer will be seen as a great, free, addition to those who already own the modules for their primary function.